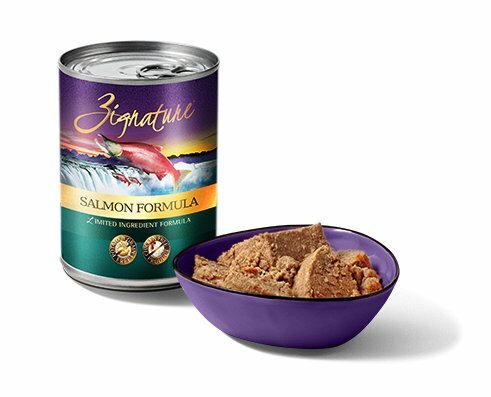 Made from Salmon in the Pacific Northwest of the USA, this limited ingredient dog food is a great source of heart-friendly Omega-3 fatty acids, making this an incredibly healthy dog food. Made from Salmon in the Pacific Northwest of the USA, this limited ingredient dog food is a great source of heart-friendly Omega-3 fatty acids, making this an incredibly healthy dog food. Our Salmon Formula is a grain free dog food, meaning that everything from small sized dogs to medium sized dogs, to the biggest dogs will benefit from the elimination of any pet food allergy. Hypoallergenic dog food means this dog food is balanced with power antioxidants and is rich in low glycemic carbohydrates. The best dog food treats your pup like you would treat your family. Salmon, Fish Broth, Salmon Meal, Peas, Chickpeas, Agar-Agar, Sun-Cured Alfalfa Meal, Potassium Chloride, Choline Chloride, Salt, Calcium Carbonate, Minerals (Iron Proteinate, Zinc Proteinate, Manganese Proteinate, Copper Proteinate, Magnesium Proteinate, Sodium Selenite, Calcium Iodate), Vitamins (Vitamin E Supplement, Thiamine Mononitrate, Niacin Supplement, Calcium Pantothenate, Biotin, Vitamin A Supplement, Riboflavin Supplement, Vitamin D3 Supplement, Vitamin B12 Supplement, Pyridoxine Hydrochloride, Folic Acid).